Service site enlarged to 21,000 sq.ft. 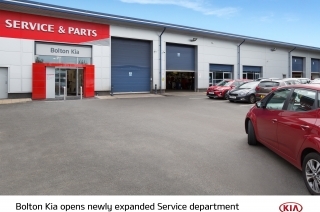 Kia Motors (UK) Ltd is pleased to announce that Bolton Kia have expanded their Service department, located 300 yards away from their flagship sales showroom on Middlebrook Retail Park, Bolton. The Service department has expanded from 15,600 square-feet to 21,000 and now includes 11 service bays, capable of servicing 12,000 cars a year. Two EV charging points are now available to customers and EV drivers, one located at the Service centre and the other at the Sales site. Three new Service staff members have been employed including two Service Advisors and a Technician which brings the overall team at the Service site up to ten. 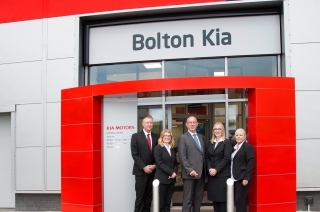 Bolton Kia now employs 45 people across both sites. The expansion includes three different waiting areas comprising of a quiet waiting lounge, TV lounge and a kid’s area with a PlayStation®. There is also a new parts desk that is located within the Service centre reception area, a refreshments area alongside a modern reception area. Parking has also been improved for customers with the number of car parking spaces doubled. 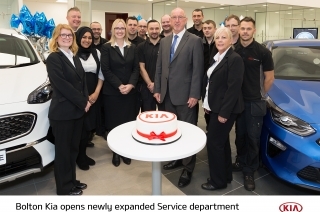 “The team at Bolton Kia are pleased to be part of such a large development and with the addition of three new Service staff members we will be able to provide an outstanding experience to our existing and potential customers in the Bolton area. Kia continues to grow and evolve and the development of our dealership reflects this. Our Service department is now open and ready to welcome customers.” he added. For more information on Kia Bolton please call Sales on 01204828941 or Services on 01204828939.